A product merchandising sample will help your next Product Merchandising survey. Customized product merchandising samples like these one are easy to create and customize. Best of all, merchandising samples can be recorded on any mobile device or kiosk offline without relying on store wifi. Knowing what products you have available and conversely knowing which products are not available is invaluable in retail. You need to know what is in your store. Do you own multiple locations? Are you perhaps a franchise? All collected product merchandising data from multiple locations can be synced to one account. Do not collect in store product merchandise data by examining different penmanship from multiple employees at multiple locations. With a digital product merchandising form you can collect uniform data in real time from all locations. With trackable, digital data you can compare and contrast different product displays, seasonality, different locations are more. Consistent product merchandising data is product merchandising data that you can trust. Don’t get coffee stains on your store’s inventory. With our product merchandising sample forms you can get started quickly and efficiently with your inventory surveys. Collected retail data is actionable data. You will save money on paper and pens if you use a product merchandising app. If you collect the data digitally, whether Android or IOS, on phones, tablets or computers, that data will accessible, consistent and protected. 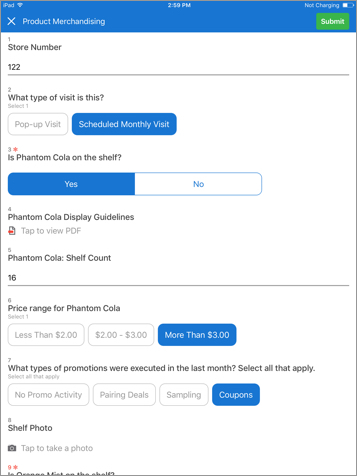 QuickTapSurvey’s product merchandiser app can ensure that your displays are visually appealing and that your product displays are sufficiently stocked. Convert shoppers into buyers by collecting the right data for your stores. Searching for last year’s Valentine’s day merchandise data in a filing cabinet might not be the best use of your time. With online product data you can analyze your inventory data and make decisions that will help grow your business.